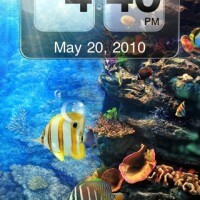 Amazing Aquarium Clock is a simple and very tranquil clock app. The app is essentially a clock with an animated wallpaper. The app includes five different coral reef wallpapers that are very colorful and very tranquil. Each wallpaper includes the specific attributes of a coral reef, which makes the app great because the image does not look fake or poorly made. While the background image is not entirely animated, the image does have tropical fish swimming in the reef and little bubbles floating around. 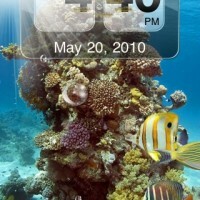 The fish slowly swim around from left to right and right to left across the iPhone display. Along the top center of the background is a clock, showing the current time and date. 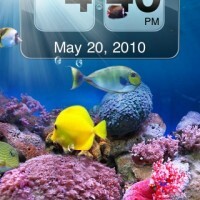 Swiping left or right on the background will swap through the other coral reef backgrounds and users can hide the clock by tapping on it and just watch the coral reef and fish. In the Info section within the app, the time can be changed to be either 12 or 24-hour format. The app is ideal for a desktop environment, as the clock does not disappear until the user closes the app. In other words, the app with your iPhone, and a dock, make a great desktop clock! The developer has an entire series of these animated background clock apps, but the Aquarium one is definitely the more tranquil among the group. 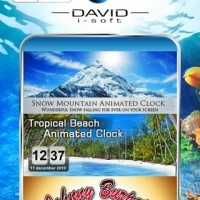 Amazing Aquarium Clock is available in the App Store for $0.99. 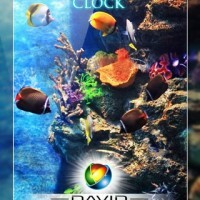 If you want to have Amazing Aquarium Clock, I have FOUR copies to give away to iPhoneinCanada.ca readers! To win, tell me how you would use Amazing Aquarium Clock! Winners chosen at random; Contest ends May 23, 2010 at 1:30AM PST. 1.) Make sure to include your email in the email entry field or I cannot contact you! 2.) One Contest Entry Per Person. Do not attempt to post multiple contest entries under different emails and/or user names during the same contest. The Google vs Apple War is On!